Filing taxes can be a confusing activity to everyone, especially to those new to it. One confusion that we encounter is choosing the right form for our purpose. We go straight to the Bureau of Internal Revenue (BIR) and get overwhelmed with tons of forms getting in our hand. Further, the BIR recently released a new form named 1701A in the eBIR forms last month. This not only means that a new tax service will be offered to Filipinos, but a new service for us to process. 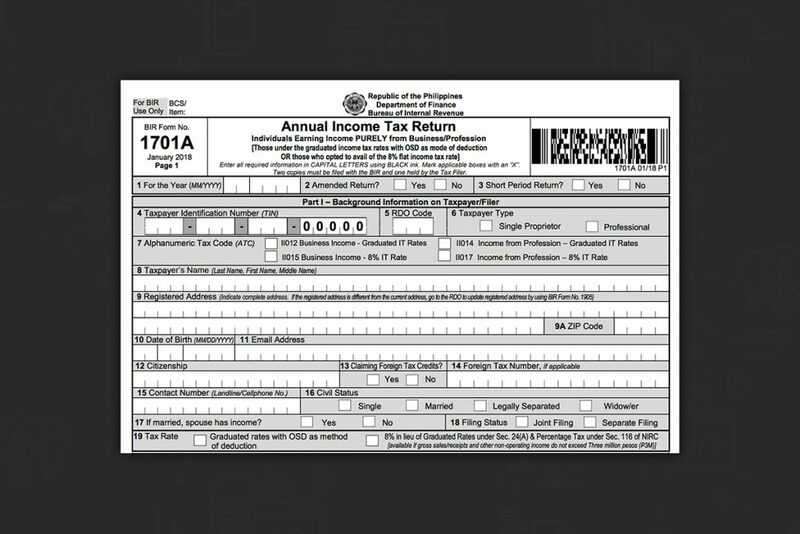 To help you out, the 1701A form is also now made available in JuanTax. What this means is that you can electronically send your returns in JuanTax conveniently! Read on as we debunk the general use of the form, what is it, its difference with form 1701, and who are applicable to use it. What Is BIR Form 1701A? BIR form 1701A is the Annual Income Tax Return for Individuals Earning Income PURELY from Business/Profession. It shall be used by a self-employed individual or freelancer who is purely earning from his/her profession and aiming to avail the 8% income tax rate and Optional Standard Deductions under Graduated Rates. For self-employed individuals or freelancers who have mixed-income, they will still be using BIR form 1701 or Annual Income Tax Return for Self-Employed Individuals, Estates and Trusts. Similar to the 1701 form, the deadline of form 1701A will still be on April 15 preceding the taxable year. What Is the Difference Between Form 1701 and 1701A? The main difference between the forms is that form 1701 is for those with mixed-income (eg. someone who is both a freelance writer and a teacher), while 1701A is for those whose income is only coming from his/her business or profession (eg. a full-time freelance writer or a bakery owner). Form 1701A seems to be an answer to individuals who pursued to be completely self-employed, which is now in its growth rate. It also applies the Tax Reform for Acceleration and Inclusion (TRAIN) Law and tax rates for 2019. Further, the new form will be easier and faster to fill out since it has only 2 pages compared to form 1701 with 4 pages. There is also the form 1701Q which is the Quarterly Income Tax Return for Individuals, Estates, and Trusts Description. Who Will Use Form 1701A? A resident alien, non-resident citizen or non-resident alien (within the Philippines). B. Those who availed of the 8% flat income tax rate whose sales/receipts and other non-operating income do not exceed P3M. If the 1701A form is intended for your needs, then you can easily file your form at juan.tax, a cloud-based tax filing system that you can use on any computer systems and web platforms. All you need to do is enter your sales and purchases and it will automatically be entered in the proper forms. Further, all your tax forms will be compiled and saved online if you need to access it anytime. We at JuanTax prioritize hassle-free and safe filing and paying of taxes. Contact us at help.juan.tax or chat with us on our website https://juan.tax/.